So, another update on the kitchen. The contractor got my letter and attempted to remedy. Poorly. He actually made things worse. Such as this lovely job he did to “fix” my window. Yes, he literally cut off a chunk of the window and slammed it over the hole. And yes, he put it in upside down to attempt to cover his mistake. Yes, he over-stained it. Three days later, it was still tacky. 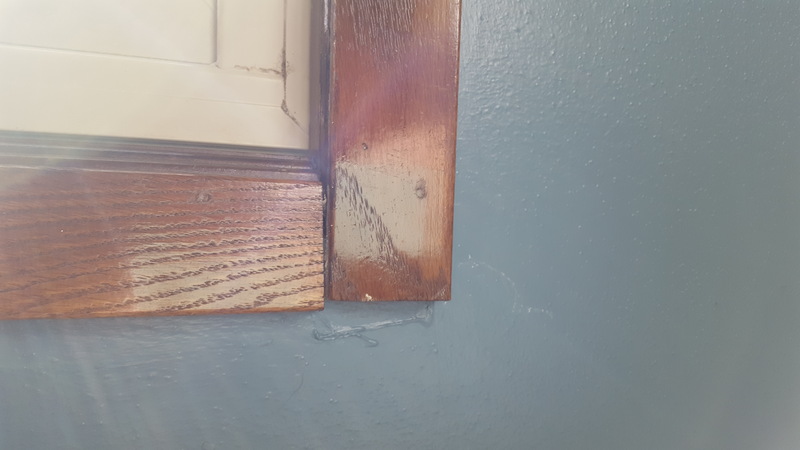 Yes, he damaged the wall around it and got stain on the window sill itself. He argued with me that there was nothing wrong with the floor or it was my fault that the pieces didn’t properly attach to each other. I went to our maintenance person who has been overseeing a $20M renovation on my company’s building asking for guidance. He introduced me to our buyer’s agent who represents us with our contractor. This person is an expert in all things construction at the commercial level, so a higher standard than residential. He oversees contractors for companies to make sure they do good work and live up to their contracts. He took one look at the pictures at was angry because this contractor gave them all a bad name. He read the letter I sent and agreed to come over and talk to the contractor on my behalf. He said it would be a fifteen minute conversation. Once he got to our home, he was even more appalled at the shoddy workmanship. Stuff I hadn’t noticed, but he said was amateurish at best. He waited for the contractor then pointed out issue after issue to the contractor, telling the contractor that the work was unacceptable and not up to industry standards. When the contractor argued, he stated industry standard . At the end, we agreed to pay the sub contractors as they were still owed. We agreed we’d bring in a separate contractor to fix the issues then we would pay the original contractor the difference between his final payment and what we had to pay the sub contractors and the contractor who was going to fix the issues. The original contractor was furious and stormed out of our home. Turns out we were lucky as we were obligated to allow him to try to fix his mistakes, even if he continued to make them worse. We have brought in a new contractor highly recommended to try to fix the mess. They can’t even quote on it as there is so much wrong, and the more they dig into the workmanship, the more they find. We’ll be paying time and materials. My gut is telling me we’ll be paying as much or more to fix it as we were supposed to pay to have it done in the first place. Not much to be done about it at this point. My one prayer is that I never hear back from the original contractor. I don’t ever want to see him again. I worry he is going to come after me and try to take me to court for his final payment as he clearly saw nothing wrong with his work. Even at the end, he couldn’t figure out why we were upset and clearly felt wronged. As a note to anyone considering it, NEVER REMODEL YOUR KITCHEN!